Taste test: When you first bite into these chips, you get a mild dill pickle flavor and no heat, but soon after, a tasty, medium-strength lingering heat kicks in. They're thin with a very soft crunch, and pretty good. The dill taste is very good. 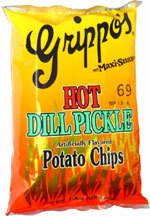 It's not a super-strength heat — if you want that, go to Chicago and get Jay's hot pickle chips. Smell test: A pickle smell, but not that strong. This snack was discovered by Jeremy at Joey's Deli, Cincinnati. Review published .